Posted on Sun, Feb 7, 2010 : 6:17 a.m.
Michigan rode the automobile to prosperity in the 1950s and ‘60s. But now we find ourselves falling further and further behind in the new economy. If we hope to catch up, one of the answers has to be high-speed rail. That is why it’s disappointing to see Michigan’s efforts toward high-speed railroad service languish, while the federal government funds similar projects elsewhere in the Midwest, as well as in states like California and Florida. Yes, Ann Arbor and the state as a whole will benefit from the $244 million in federal stimulus funds that were announced last month. That money will improve the existing Amtrak service between Detroit and Chicago, which stops in Ann Arbor. We welcome any federal investment in rail service, but these improvements will not bring Michigan closer to its goal of high-speed rail service. If Michigan is to regain its competitiveness for new industry and 21st Century jobs, it cannot afford to lag the nation on an issue as important as high-speed rail. The state’s vision for fast, convenient, reliable rail service between Detroit and Chicago is laid out in the Midwest Regional Rail Initiative, a plan that’s been in the works since the mid-1990s. To understand how Ann Arbor’s future economic health is tied to high-speed rail, consider the case of Menlo Innovations, a local high-tech company that has enjoyed rapid revenue growth over the past five years, despite the down economy. Menlo CEO Rich Sheridan says high-speed rail would be a boon for his company, helping him generate more business out of the Chicago market, and helping him hire talented employees who are attracted to areas that have good mass transit. 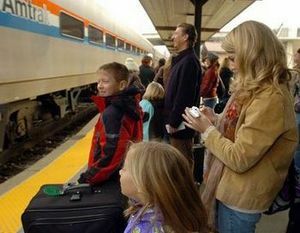 The current service from Detroit to Chicago is one of the nation’s most heavily used outside of the East Coast, carrying 472,000 passengers in fiscal 2008. Ann Arbor was Michigan’s busiest stop on the route. But the trip takes five and a half hours, and the service doesn’t run frequently enough or reliably enough. Super-fast rail service of 220 mph isn’t feasible in the immediate future, but service of 110 mph would be. The goal of the Midwest Rail Initiative is cut nearly two hours off the travel time between Detroit and Chicago, and run nine trains a day. That would make the service much more viable for business and leisure travel, and create new economic opportunities for communities along the corridor, generating both construction jobs and permanent employment. The Detroit-to-Chicago route has some inherent advantages for future high-speed rail. The condition of existing tracks is among the best in the country, and the 97 miles of track that Amtrak owns between Kalamazoo and Porter, Ind., is the longest stretch of track the company owns outside the Northeast. The investment required for high-speed rail would be substantial - in the billions. That’s expensive, just as it was expensive to build the infrastructure to support the auto industry that enriched Michigan in past decades. Now we find ourselves a Rust Belt state struggling to compete with more prosperous regions. A failure to develop high-speed rail will leave us even less competitive. Last year, the state applied for up to $800 million in federal funding for high-speed rail. We must continue to press for a share of federal investment in this important form of transit. Communities like Ann Arbor must demonstrate their strong support for high-speed rail and citizens should urge their state and federal lawmakers to back funding for this service. Because Michigan’s economy has been so reliant on the auto industry, development of mass transit has lagged here. We can’t let our love for cars leave us blind to the importance that fast, convenient, reliable mass transit will play in the economy of the future. At a time when we have the nation’s highest unemployment rate and lead the country in population loss, we could ask, what has become of Michigan? The better question is, what should Michigan become, and how do we get there? The answers are not easy, but one way we could get there would be via high-speed rail. Tue, Mar 16, 2010 : 11:03 a.m. It seems to me that existing railroad tracks could be put to good use in Michigan. Through proper planning, and perhaps some fed stimulus dollars, has anyone considered looking at re-introducing rail as a viable tourism option? Not for just getting people to Michigan, but beyond that. Say, a coastline rail - patterned after the Oriental Luxury lines so popular in Europe. Additional depots in tourism areas, or more lines running from Grand Rapids to those areas. Considering not just the end destination, but how people might get from a depot to outlying areas rich in experiential tourism, i.e. inland lakes, campsites and resorts. Through the use of a sort of "reverse engineering" such as the addition of rental vehicles (and not just any vehicles, but infrastructure for use of electric and hybrid transport, or bike, rental, with luggage pick up and drop off options.) Even allowing for resorts to run for example, horse drawn carriage transport, snowmobile or CAT transport in the winter - fun and different ways for tourists to enjoy all the state has to offer. Michigan has a chance here of becoming a bell-weather for the use of green energy and creating inter-state transport options that would be a shining example of infrastructure. Creating something of this nature that works for tourism would set an example for other parts of the nation dealing with transport issues. Not to mention the jobs it would create, and the ideal way in which it would allow people more flexibility in getting to different seasonal jobs around the state. It seems to that putting some funding into researching this possibility would be prudent and good for the state and it's residents. Rail was the right choice 100 years ago, and I think it's the right choice again. Tue, Feb 9, 2010 : 6:35 p.m.
What a great discussion! Imagine a sane, civilized society that might have invested in trains and mass transit instead of interstate highways. Read Fast Food Nation! And then imagine the vision put forth by the bank president and the business executives who aren't locked in to the crumbling infrastructure of the roads, bridges and highways to transport the autos. We have the money, it is misspent. And now we can't even maintain our roads and bridges! I love to fly but it is really a pain for the short flights I used to routinely take. Tue, Feb 9, 2010 : 5:55 p.m.
As a member of the AnnArbor.com editorial board and a bank president who has overseen $275 million in venture capital investments in my 22 year career I strongly support building a high speed rail line (and high speed freight) between Chicago, Ann Arbor, Detroit &amp; Toronto. I believe that this would be a good investment and that private equity should back it. The M1 Rail Project on Woodward Avenue in Detroit is a good example of a private rail project that makes economic sense. All railroads in the U.S. were built with private risk capital. The massively subsidized U.S. Superhighway system has crowded out these investments, but the case for high speed inter-city rail is compelling for many reasons. The Japanese high speed rail system (they started building it in 1962 when Made In Japan was a byword for cheap plastic crap) was privatized and that company was sold for $90 billion to private investors. Unfortunately, Michigan is the Sahara of Venture Capital, so there may not be sufficient private equity capital to pull this off. In the past, when there was a good business idea searching for capital, the backers were sent to Wall Street where after much back-room deal-making the money was raised (just as the money was raised to build many of the railroads in the U.S.). Unfortunately, the geniuses on Wall Street decided a number of years ago that slicing, dicing and buying pieces of debt paper with massive leverage was a more profitable activity than raising the capital to build up good businesses (a/k/a making money the old fashioned way). That is a major reason why our country has not grown any new jobs for the past decade. Especially in a great depression, where the country should be searching out good and valuable projects to back with the public purse I agree with some famous words from the last Depression that Perhaps you will think the proposals too ambitious, too idealistic, altogether too grand. But isnt this a merit? Tue, Feb 9, 2010 : 10:52 a.m.
Tue, Feb 9, 2010 : 1:08 a.m.
Not taking into account the end of cheap, abundant fossil fuels that will follow the peak of world oil production (which we may have already passed), the need to reduce carbon emissions and the relationship between both of those and the economic crisis ignores the necessary context within which to consider this possibility. Wanting it will not make it viable or sustainable. It didn't get done in the last several decades when energy was cheaper and capital was more abundant. It's not likely to get done now. Maybe after the renewable energy infrastructure (wind turbines in Lake Michigan?) is constructed (could we possibly build rail infrastructure at the same time? ), high-speed rail will become feasible in this region. However, I wouldn't be surprised if a light-weight, moderate-speed (40 mph or so), personal rapid transit (PRT) system, like JPods, ends up being the preferred (i.e., sustainable) platform. Mon, Feb 8, 2010 : 5 p.m. It isn't particularly useful to compare the American midwest with western europe. If high speed rail was some kind of economic panacea, then europe should be flourishing - no shortage of nifty trains there. However, it is no secret that most west european economies have at least as many problems as we do. Low or no GDP growth, low job growth, HIGH taxes, quasi-socialist governments, high youth unemployment - to mention a few. The trains may run on time, and have convenient schedules, but are they are hardly sufficient, in and of themselves, to create prosperity. Same goes for Japan - fastest trains in the world there, but nevertheless a problematic economy since the early '90s. I'm glad to see Mr. Sheridan doing so well in these difficult times, but if he wants to be able to work and snooze on the way to Chicago he would be better off just buying a limo and hiring a driver. I doubt there is much political will for high speed rail statewide, let alone money - in any case. Michigan is a pretty conservative place, outside of Detroit/Ann Arbor area. Mon, Feb 8, 2010 : 4:27 p.m.
Its incredible the number of people who have forgotten the oil price shock of 2007/2008. The energy efficiency of even the 110mph diesel tilt trains over short haul flights is clear, and unlike air, the 110mph diesel corridors can be upgraded to electric transport using mature, well tested technology - so intercity travel in, out of, and into Michigan can be powered by the winds off Lake Michigan. Also note that the conflict in terms of smooth operation is not between passenger rail and freight rail, but between RAPID RAIL and SLOW, HEAVY RAIL. If a Rapid Rail path is established, it can support reliable scheduled passenger operation as well as Rapid Freight Rail. And Rapid Freight Rail corridors to take container freight faster than diesel road freight can travel is an essential step to cutting down the wear and tear on the Interstates and State Routes, so that Michigan can AFFORD to keep them in a state of good repair. Mon, Feb 8, 2010 : 4:25 p.m.
$2.6 billion dollars for the region. John Stossel had a program on this very issue. It is a complete boondoggle. There is nowhere in the US where anything like this works. And think about this, even if the train station in Detroit is full of people going to Chicago (I bet it is not the same in reverse), Amtrak still needs subsidies. Hey government! Leave the money in hands of the people. You are terrible at doing everything. Knock it off!!!! Mon, Feb 8, 2010 : 10:21 a.m.
Good editorial and good comments. Thank you, Rich Sheridan, for being the voice of the forward-looking business community. Southern Michigan actually has population density quite sufficient to support fast, frequent trains. SNCF, the French rail company, has proposed a business model for a high-speed Midwest rail network which they believe will be self-supporting, once the infrastructure is in place. That's more than we can say for our highways. Remember the Interstate Highway System cost $1.3 trillion nationwide over about 40 years, and not only does it not pay for itself, it costs lots of money for maintenance. Roads, airports, rails, schools, water and sewage: these are all the infrastructure components that make an area attractive to private investment. As Michigan continues to cut back on those investments, it's no wonder businesses cut back on theirs and people leave the state. High speed rail and effective transit is certainly not "the magic bullet" for Michigan. But it's an essential component that's missing from our infrastructure - a component that needs to be added. It's also important because transportation is such a large part of everyone's personal budget. Families who can live with fewer cars save over $9000 each year, much of which goes to gasoline whose income supports governments unfriendly to us. What Michigan needs is the will to work for ourselves. We've been eager for someone else to pay for our needs: get outside businesses to invest, get the Federal Government to pay, but *don't* ask us to raise our own revenue. If we don't have the confidence to invest in our own state, how can we expect anyone else to? The states that received the majority of the $8 billion ARRA high speed rail funds (California, Florida, Illinois...) were the states that were willing to invest significant amounts of their own money. Michigan, on the other hand, has reduced its support for Amtrak in the latest round of budget cuts. Nobody is going to invest in Michigan if we aren't willing to do it ourselves. I applaud members of the business community like Rich Sheridan who are willing to call for greater community investment in essential Michigan infrastructure. Now, can we get the State Senate to see that logic? Sun, Feb 7, 2010 : 11:10 p.m. There is no rail system in the world that was built solely with private money on a for profit model. They all need help both to be built and for operating but that does not mean they are not a smart idea. We need commuter rail now and high speed as ASAP. The Europeans have been very far ahead for many years in energy efficiency, using renewable energy and mass transit. Now the Chinese are moving strongly into these sectors. The US will soon be a second class nation unless we get on the ball and modernize in energy and transportation. Sun, Feb 7, 2010 : 6:23 p.m.
Rich, I like your enthusiasm. However, if you were to create a business model and pitch the idea to private entities, I doubt there would be any interest. Although now is the best time in a generation to obtain public funding for such a project, the future of SE Michigan is far too unclear at this point to justify such a massive capital expenditure. I agree with you that high speed rail will play a necessary role in the future, but it is too early to determine what that role in SE Michigan will be. Sun, Feb 7, 2010 : 5:29 p.m. It takes me five hours door-to-door to travel to Chicago. Planes, trains or automobiles, it doesnt matter, it takes five hours door-to-door. This means I cannot treat Chicago as a visit in a day business destination. The result? A smaller Menlo, less local jobs, less economic prosperity for us and our community. We have a great and growing business, it could simply be bigger and more prosperous locally if it was easier (more frictionless) to do business in a wider geography. Similarly for Toronto and Milwaukee, Cleveland and even Grand Rapids. The Midwest is an economic powerhouse disconnected from each other. The sum of the pieces is currently less than the whole. Just as a reminder: Populations of Wisconsin + Illinois + Indiana + Ohio + Michigan + Ontario = 60M people! Now, lets imagine a different future. Imagine I could take a commuter-rail line from downtown Ann Arbor (the current Amtrak station) to the proposed Aerotropolis between Willow Run and Detroit Metro Airport. Lets rename it the Aerailtroplois where people, goods, services and ideas come together from all over the world. These highly functioning elements of commerce would then depart on high-speed bullet trains west to Chicago and Milwaukee and east to Toronto, southeast to Cleveland and northwest to Grand Rapids. Now I can trim my business travel time in half and enjoy great comfort and community while being able to surf the internet and do work, have meetings and meet new people all in the comfort that many of us have had the opportunity to experience in other parts of the world such as Germany, France, or Japan. Air travel cannot match this on trips of 500 miles or less. Crazy idea? Why? Too expensive? Compared to what? Not the right time? Then when? Here are my deeper answers to the above questions: Too Crazy? We really dont have to invent anything new other than the collective will to think differently. The proven technology already exists. We can learn from the experiences of others. Too expensive? People and economic fortune have followed roads of commerce throughout human history. The faster the route, the more economic fortune that follows. Our continent was discovered during such a pursuit. Detroit and the Midwest have every natural reason to lead such a redevelopment. We are well positioned geographically, we have the talent to pull it off and we have the imperative to spur us to action. Our other choice is to follow the downward economic spiral by hanging on to the past and standing by as others invent the future. Not the right time? I cant think of a better time. As our federal government weighs the options of revitalizing our economy, we seem to only get as creative as repaving roads that will again deteriorate within a few years. Theres talk of building a third Chicago airport. What good will that do if the reason Chicago airspace is so snarled is the number of flights already heading there? If Chicago wins some future Olympics, a two-hour bullet train to southest Michigan could open up sports venues in our region to the Chicagoland area Olympic effort. Why not have the investments we are about to make leave a lasting legacy that creates a game-changing impact? In this era of brain-drain and youth attraction and retention concerns and initiatives, I can assure you that young people seek areas that are well-connected with accessible and sensible transit systems. Add this component to an area that already includes affordable housing, great schools and universities, abundant water, plentiful play spaces for every hobby imaginable, a lack of disastrous weather events and a friendliness that surpasses every other region of the nation and we would become a magnet for the talent that thriving businesses like Google (and Menlo!) seek to attract and hire. Finally, this is not simply an investment in infrastructure but also a business model that will employ throngs of mechanical engineers, propulsion engineers, civil engineers, planners, high-tech manufacturing engineers, industrial operations engineers, software engineers, construction teams and all the surrounding support staff and management that this area has in great abundance. What other area of the country and the world wouldnt also want such a system? We could be a center that designs and delivers such systems. The time and opportunity is now. We must coalesce the courage and will to make transformative changes necessary to leave our part of the world better than we found it. One hundred years ago, our region transformed the world. Ford, Edison, Kellogg, the Wright Brothers, and many others lead that transformation. Let us ride the shoulders of these giants to once again lead the world in innovation and industry. Let's finally consider the argument that we cannot afford such an investment. It would be interesting to do the calculation to see if we are already paying for this without getting it! Consider the current effect and cost of all of the unemployed engineers in our region and those that support them. Unemployment insurance, foreclosures, unpaid property taxes, empty seats in schools as families have departed, students who are educated here but then leave for other regions, businesses that don't grow as they are stifled by all of the factors I've mentioned. Let's at least give this the thought it deserves! Sun, Feb 7, 2010 : 4:35 p.m. Even if some clueless politician was foolish enough to buy this baloney, and fund this boondoggle - by the time they got it built, many years hence - the state of Michigan will have so few people living along this corridor that it will truly be a "train to nowhere". You notice that the locales getting the most federal dollars for high speed rail are all places with rapidly growing (and LARGE) populations across the south and west, not the "Titanic" of the midwest. An yes, Ann Arbor, the Titanic is unsinkable!!... blub, blub, blub! Sun, Feb 7, 2010 : 4:06 p.m. It's silly to place hopes on some magic fast train reviving our economy. And public-sector spending is only a temporary fix to a long-term unemployment problem. Despite what our president and our governor think, government can't spend our way out of a recession. We have neither the population density nor the job density to make trains anything more than a backup transportation solution. Better trains would be of serious benefit to only a tiny percentage of the population. We are far better off spending that kind of money on discovering renewable sources of energy for our cars and trucks, and maintaining our roads, which are literally crumbling because of our state's mismanagement of the money we have given them. The absolute last thing we should be doing is claiming trains have magic powers and banking everything on public development that will not do a whole lot for us. It's irresponsible. If high-speed trains were truly magic, private investors would be building them. They're not. Sun, Feb 7, 2010 : 3:22 p.m.
My gut says build a high speed rail between Chicago and Detroit and what you get is people from SE Michigan zipping to Chicago to spend their discretionary entertainment income. Comparing the U.S. to Europe or Detroit/Chicago to the east coast in both cases is comparing kumquats to Aardvarks. We don't have nearly the population density that Europe does that is conducive to train travel. As far as the east coast its 280-300 miles from Detroit to Chicago with not much in between. Its about 450 miles between Boston and Washington with New York, Philadelphia and Baltimore in between. Sun, Feb 7, 2010 : 12:43 p.m.
Great editorial. High-speed rail would further strengthen the state's University Research Corridor by linking that enormous brain power to the region's economic areas. One of the reason's the East Coast is such a formidable force is because the rail system in that part of the country has effectively linked the coast in such a manner that one can do business in multiple cities all in one day. You cannot over estimate the impact of facilitating the ease with which smart, creative people can get together and talk over breakfast, lunch, dinner, or drinks. Sun, Feb 7, 2010 : 11:28 a.m.
1. Build the locomotives and cars at Willow Run. 2. Use US produced steel for more tracks and bridge widening. 3. DIRECT airport connection. 4. Direct service from Chicago-Detroit-Windsor-Toronto. Sun, Feb 7, 2010 : 11:15 a.m.
Sun, Feb 7, 2010 : 10:52 a.m.
Scooter dog, Although the Detroit to Chicago Amtrak trip is VERY popular (go to the Amtrak station any morning, especially weekends and it is jammed...I know because I ride this train)....it would be even more popular if: 1. It was high speed 2. If it ran on it's own tracks. Amtrak A2 to Chicago is a project that has run for years only half-completed. It needs fully committed tracks so that it doesn't have to sit an wait for freight trains and it can run full speed. It's amazing that it is a success when it's never had a real commitment to making it viable regional transport. How successful would the auto be if we never build anything but dirt cow paths through America? In reality that's been the commitment we've made to urban rail and yet it still carries passengers daily. Amazing. But it's past time to commit to high speed rail and get off the "cow path" tracks between Detroit and Chicago. Sun, Feb 7, 2010 : 10:39 a.m. This is spot on. The city of Ann Arbor's efforts are one of the bright spots in this state. Showing strong support for rail is smart given A2 is right in the middle of this line and is the most used stop between Det. and Chicago. But they have to build the new station for the commuters. The old station on Depot will not handle any more riders. Well said Mr. Dearing. Commuter rail is going in all across the US and it will be needed to bring people to the high speed. This state finally has a chance for modern transit. It will open up new economic opportunities. Sun, Feb 7, 2010 : 10:32 a.m. They rebuilt the rails from detroit to chicago 15 yrs ago and took out the second rail and added new engines and cars and "Hello" nothing happened.Amtrack still needed huge taxpayer bailouts to stay operating.So doing it again is just pouring more money down the drain. Why not take the 244 million and invest in roads and bridges. People are not going to use the train.Your dreaming.The american family will use the auto till hell freezes over before using the trains for transportation. Sun, Feb 7, 2010 : 9:32 a.m.
With the Jan 28, 2010 $244 Million Dollar federal set aside for the Chicago/Detroit route, public imput is really important. All affected areas should run news articles and encourage feedback. At this point it is difficult to clearly determine the cost versus the (long term)gains. Is there a "corridor initiative" that is sharing information and getting input? Sun, Feb 7, 2010 : 8:56 a.m.
High Speed Rail will do nothing but waste money. Nobody will use it and it will burn millions of tax dollars. Sun, Feb 7, 2010 : 8:51 a.m.
Ms. Murray, You must have been reading my mind about building the trains in Michigan. I was hoping that President Obama would not keep stoking the fires of automobile production, but instead rebuild our mass transit system. We have idle factory space and a good number of skilled workers who could be easily trained to build not only trains, but other modes of transportation like buses. As an aside to this, I would love to take a high speed train to Chicago or anywhere alse for that matter. I don't like air travel because of the long wait and gouging that the airlines have become accustomed to. I used to take the insanely efficient German rail when I was there. Not only did it get me to where I wanted to go in a cost effective and timely manner, but it added an air of genteelness I find lacking with air and car travel. Sun, Feb 7, 2010 : 8:25 a.m. The way to rebuild Michigan's economy is to support what will drive Michigan to produce things other people want to buy. It could be batteries, pharmaceuticals, medical devices, education, precision parts, or vacations. When other people buy things that we produce, we will have jobs. A fast train to Chicago? After the construction period, how does that bring money to Ann Arbor or Michigan? It will make it easier for us to go to Chicago to shop, but that's money going the other way. People from Chicago aren't going to come here to shop. The train system on the East Coast moves people to their jobs. Unless we expect to work in Chicago, there seems to be little benefit to us, after the construction ends (and no benefit to most of us who won't be working on the construction). Supporters of a trillion dollar project to build mink-lined caves for bats can come up with reports from economists at good universities that show how the caves will produce untold tax revenues and $100K jobs for high school dropouts. They do that sort of thing constantly (and with impressive data tables and charts). Let's use our common sense - in the end it's less likely to fool us. Sun, Feb 7, 2010 : 8:13 a.m.
First, if we want this investment to have an impact on Michigan, we need to get our hands on the production of the trains. If the administration is shelling out the money, why should we send our money overseas to have the trains built? Keep the money here in the US, and more specifically in Michigan. Why be so hasty that we can't keep the benefits where it works back into the economy? If Billions of dollars are on the line, shouldn't we have a Ford or a GM high speed train? It sounds better than batteries. Secondly, the money that I have seen spent and approved so far is for cosmetic improvements to the stations: new facilities, nice landscaping. Specifically for the Troy location, which I would utilize if we could get the high-speed rail up and running, did nothing to address parking, which there is a serious issue. The design allows one only to bus in or be dropped off. Do these people making these decisions actually try to use the facilities themselves, or only like the pretty drawings that are laid out before them? There is no parking facility in Troy. There are limited locations to park on the street. If we are talking about expansion of usage, they need to plan on hundreds of people using the facilities, and there should be parking to accommodate. Perhaps they should study Chicago a little better. Their park and ride locations are very smart and very functional. Sun, Feb 7, 2010 : 7:02 a.m.
"High-speed rail would get Michigan's economy back on track" Your editorial would be more persuasive if it were more modest about the benefits of investing (up to) billions of dollars in a high-speed Detroit-Chicago rail connection. Have there been any reliable studies on the matter? You can't tell from the editorial, because the only 'data' is a short quotation from an interview with the CEO of a local tech firm. Notice I use the word "reliable" above. It seems like every time a proposed (expensive) public project comes along, it is justified in part by vast promises of future benefits backed up by anecdotal evidence. Let's get some hard information before we spend billions of dollars we don't have.